The name Mama Jean’s Bar-B-Q Shack is, in fact, a misnomer. This joint is no shack. Far from it, as this joint isn’t a joint at all. It’s a BBQ truck. Specifically, it’s a truck where you order barbecue that is cooked next to the truck on a large charcoal and hickory chip fueled cooker. Although Mama Jean’s is far from trendy–in the best possible way–it is part of a growing trend in the food truck rich Triangle area, where everything from juice to burgers to tacos to crepes is hawked out of mobile restaurants on wheels. 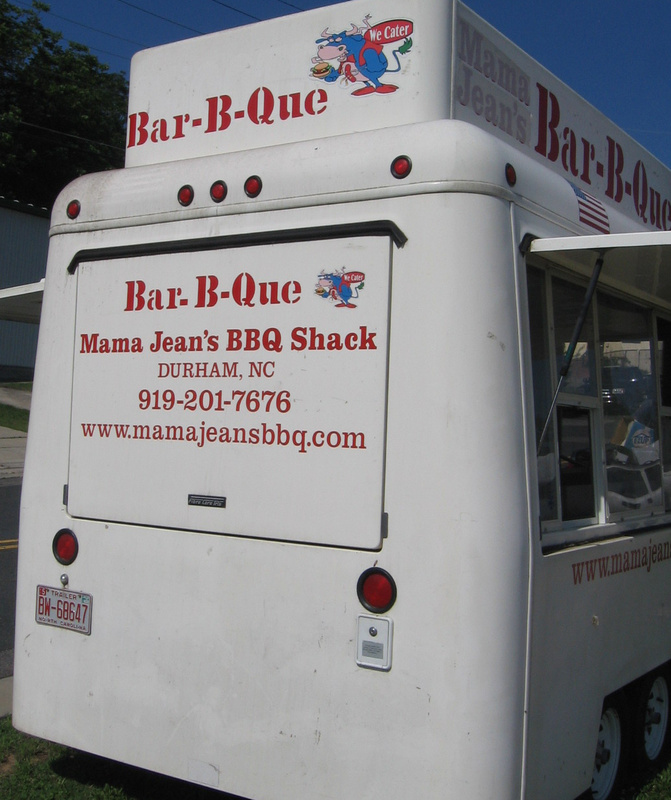 And Mama Jean’s serves some of the best barbecue I’ve had in the Triangle, whether the ‘cue is on wheels or not. 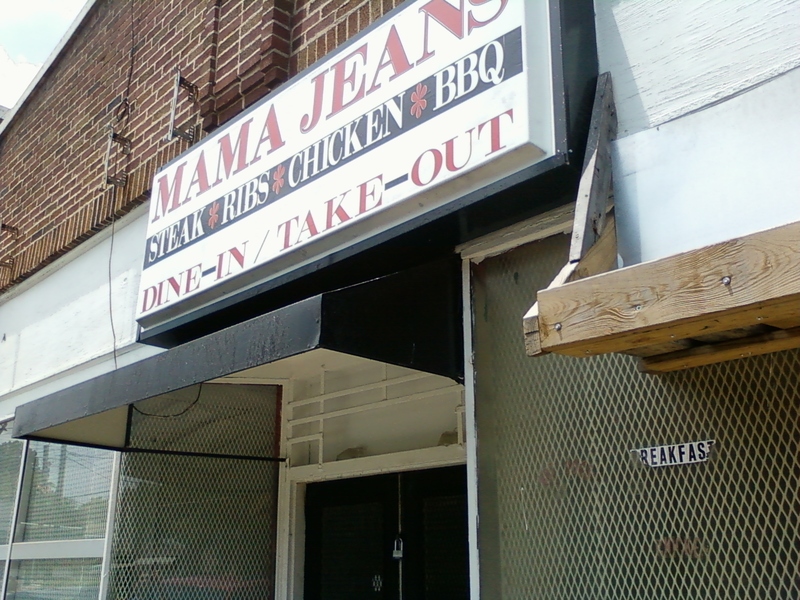 According to Antonio Hill, Mama Jean’s owner and pitmaster, Mama Jean’s will be opening a regular sit down restaurant soon on the same street where he sets up his truck. But for now, while he puts together the final pieces needed to open the storefront, he’s pretty happy selling his food out of his “BBQ shack on wheels.” Really, I could care less about where he sells his food. He can cook and he does it with charcoal and wood chips, which is close enough to traditional wood-cooking for me. Heck, if it continues to taste good he can sell his ‘cue out of the back of a Ford Fiesta for all I care. There is no obvious menu posted on the food truck. Actually, I didn’t see a menu at all. But it’s pretty easy to tell what to order based on the tasty smells wafting off the cooker next to the truck. In addition to rough-chopped pork shoulders served with a traditional Eastern-style thin vinegar sauce, Mama Jean’s offers barbecued ribs, whole chickens, chicken wings, and more. Sides vary but included baked beans, mac ‘n’ cheese and green beans on the day I visited. 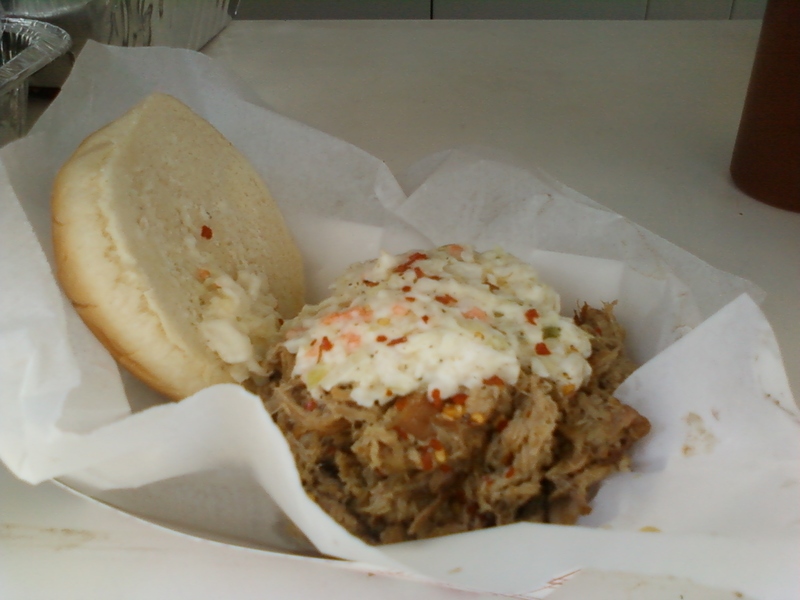 I had the barbecue sandwich, which was piled high with succulent pork, though next time I might pass on what tasted like store bought creamy coleslaw [Note: Mama Jean’s now makes their own slaw!]. I also sampled a couple of ribs, which were tender and tasty with a subtle but distinct smoky taste. Face it, BBQ ain't pretty. Mama Jean’s sets up shop around 11 a.m. on the days it is open (see details at the top of the page) and sells until around 3 p.m. unless they sell out sooner. They have a “full kitchen” (sides available) on weekdays and Saturday. On Sunday, they sell meat only, figuring people streaming out of nearby churches will order meat to take back with them for Sunday dinner [Note: Their hours have been in flux so take the hours listed here as a loose guide.]. The business plan seems to be working so far, as Mama Jean’s was close to sold out when I visited on a recent Saturday at a little after 1:00 p.m. Mama Jean’s also has a catering business that can provide anything on their regular menu as well as whole hog pig pickin’s. Full details are available on their really well designed website (unusual to have a food truck or BBQ joint with a website at all, let alone a professional looking one). It’s worth pointing out that I met Antonio Hill a few weeks ago at a barbecue cooking competition. His was the only team cooking over coals, while everyone else used gas cookers. I told Antonio then that I was excited to see him cooking the old fashioned–and tastier–way. I told him the same thing when I visited his food truck and he said other competitors at the event said he should switch to gas so he could cook a “pretty pig” that could win a competition. As I said to him, I think Antonio should either find some competitions that reward barbecue for its taste or skip these events completely. There’s nothing particularly pretty about NC barbecue (or dead hogs, for that matter) so taste is king in my book. Everything else is just lipstick on a… oh, never mind. Can they PLEASE start going to to the Food Truck Rally’s. They would be such a hit and bring in so many people with the smell of the cooker! burgeoningfoodie, good to see you make that comment. i’ve put Antonio in touch with the food truck rodeo organizer so hopefully it happens soon! I have called their number three times and they never pick up. I drove by their location once and they weren’t there– although I ended up picking up some great veggies at the new Trosa grocery store nearby so it wasn’t a total loss. But I want to know that they are there before I make the drive over there again. Can you please tell Antionio to pick up the dang phone! bbq me and wanting q, all i can say is keep calling before you visit. i am not sure where antonio is either, as i had the same experience recently… hoping he’s just on vacation or something. Hey y’all, I just got off the phone with Antonio and he stated that they are open Thursdays through Saturdays at lunch time only. They are still working on their restaurant location, but sell in front of the restaurant if you want a Q-sandwich. The restaurant location is: 308 S. Driver St., in Durham. Meanwhile, they are selling hot-dogs and Q-sandwiches at the ball park whenever there is a game. As of about a week ago, Mama Jean’s has opened up in a storefront location. They still cook over charcoal, which is good news. For now they say they’ll be open around lunch on Weds, Thurs and Fris. I’ll post a more detailed report soon. Went over to Durham this weekend hoping to score some Mama Jeans, but sadly they were closed up and the truck was no where to be found. Kind folks in the barber shop next door were kind enough to call the owner and verify they weren’t serving that day. Had a back up plan, the Q Shack on University Drive. Good stuff. Brisket was good, as were the ribs. Sausage was so-so. Will stop in again if I’m i the area.